How confident am I in my opinion of Trader Joe's Organic Mango Lemonade? So confident that I am basing my review solely on the two teeny cups I had from the local shop's sample station...that's right, I didn't even buy this...because after tasting it, I had zero interest. Normally, I like TJ's lemonades, whether mixed with iced tea or fruit-flavored. But this mango stuff? Nope. It tasted more like a mango-citrus conglomeration along the lines of some Sunny D one-off. It was so much more juice, with a thicker, pulpier feel, than what ought to be a light, cool, refreshing glass of lemonade. It neither tasted nor felt right. Nothing about it said lemonade. I'd bet it make a decent enough popsicle. But I wasn't willing to invest the $3.49 sticker price nor the freezer space to find out, because dangit, that'd be a lot of popsicles. Even the normally sugar-in-liquid-form-loving kiddos had seemed fairly unimpressed, further cementing the case to leave it on the shelf. Not gonna completely hate on it (organic is always a good thing in my book) but yeah...not so great. Naturally, since I didn't buy it, I also didn't take that picture up above. You may recognize the style. Thanks, Big Joe, for letting me borrow it from the mothership's website (namely, this link here). I considered purchasing but decoded not to, and I don't regret that decision. Both stores will let you return unsatisfactory items. At WF you can use dressing containers to sample anything without an employee present. And u can try anything in the deli, bakery cheese counter if u ask. Now I know which mango item is at the bottom of your list! Agree on the lack of lemonadeness. I bought on spec, but it's ok as a base for rum, so not a total waste. Good point...I'm not a huge rum guy, but I can see how that would work. I'm puzzled by this juice. To me it has flavors of peach/nectarine. I still like it, though. As with all the drinks, I mix with water (usually 1 part juice to 2 parts water) to make it lighter and more refreshing, and to save money! This appears to be a recently reformulated product. 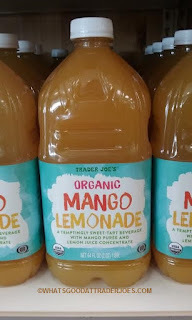 Per the labels, the old Organic Mango Lemonade, from just a few months ago, was 10% juice and had sugar as the number two ingredient, this new stuff is 21% juice and sugar is below mango puree on the ingredients list. Also, now 90 calories vs. 140 calories for the old for an 8 oz. serving. So your comment that it was 'so much more juice' is apparently spot on, you might have liked the old formula. The old formulation was leaps and bounds beyond this new one!!! I don't know what they were thinking with this one. Friends, family, tj employees(and they mentioned their customers) all prefer the old forumulation! Been drinking this old version for years I'm beyond heartbroken!